Martha : the woman of faith, who said: "I believe that you are the Christ, the Son of God, the one who was to come into the world"
Summary: St Martha, Friend of Jesus. 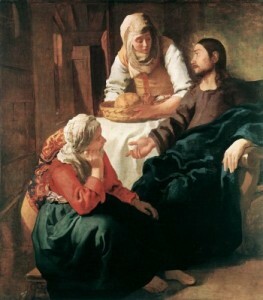 The sister of Mary and Lazarus of Bethany. Honoured for her confession of faith in the Lord in which she beseeched him to restore life to her dead brother (John 11:27). Noted too for her hospitality to Jesus and her concern for the details of service to guests. Martha is the patron saint of active, practical women, perhaps unfairly contrasted with her more laid back and “contemplative” sister Mary. Both were sisters of Lazarus of Bethany. But Martha is also the woman of faith, who said: “I believe that you are the Christ, the Son of God, the one who was to come into the world” (Jn 11:27). Patrick Duffy reviews her profile. In Aramaic the name Martha means “the lady, the mistress”, the feminine counterpart of “the master”. 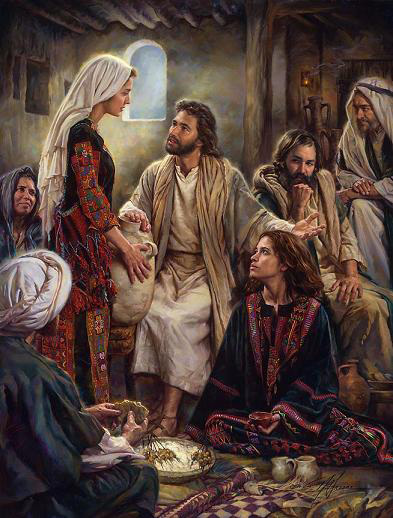 In the incident described by Luke 10:38-42, Martha is introduced as the woman who “welcomed Jesus into her house”. So hospitality is her paramount virtue. This probably accounts for her cult as the patron saint of food professionals, butlers, hotel-keepers and home-makers and why she is often depicted in art with a ladle, a broom or a set of keys as her symbol. Jesus’s disconcerting reply a rebuke? When Martha asked Jesus if it didn’t concern him that Mary was leaving her to do the serving all by herself, Jesus’s reply of praise Mary for having “chosen the better part that would not be taken from her” must have disconcerted her. It could even be interpreted as a rebuke. But in the Gospel of John, Martha appears in two incidents that puts her in a more favourable light. Martha appears again in John 12:1-8, where she serves at a meal held in Jesus’ honour at which her brother is also a guest. During this meal Mary (no further specification – can we presume it’s again Martha’s sister?) anointed the feet of Jesus, wiping them with her hair. This occasioned Judas’s question, “Why wasn’t this ointment sold for 300 denarii and the money given to the poor?” and Jesus’s remark: “She had to keep this scent for the day of my burial. You have the poor with you always, you will not always have me.” It is Martha who provides the context. Did the three go as evangelisers to Provence? According to legend, after Jesus’s death, Martha left Judea around AD 48, and went to Provence with her sister Mary (conflated with Mary Magdalene) and her brother Lazarus. They settled in and are said to have evangelised the Provence area of southern France. Among the legends associated with Martha is the one associated with the town of Tarascon-sur-Rhône. A mythological monster, the Tarasque, said to have lived in the town during the 1st century, was purportedly tamed by Martha in 48 AD. The town of Villajoyosa, Spain, honours St. Martha as its patron saint and celebrates a Festival of Moors and Christians annually in her honour. The 250-year old festival commemorates the attack on Villajoyosa by Berber pirates led by Zalé-Arraez in 1538, when, according to legend, St. Martha came to the rescue of the townsfolk by causing a flash flood which wiped out the enemy fleet, thus preventing the pirates from reaching the coast. In the Eastern Orthodox and Eastern Catholic traditions, Martha and her sister Mary are commemorated collectively among the Myrrh-bearing Women on the Sunday of the Myrrhbearers (the Third Sunday of Pascha/Easter). Lazarus Saturday: Martha also figures in the commemorations of Lazarus Saturday (the day before Palm Sunday). This has a resonance in the Roman Lectionary when the gospel of Lazarus is read on that day.